Bradford is one of my favourite residential property investment locations – it has a large University population, is a much ignored (so far) town and prices are very low with yields high. Re-generation is just beginning to quicken its pace and prices have just started moving up in earnest (see house price trends for Leeds, Bradford, Skipton and Huddersfield – showing the “ripple effect”). Bradford has its roots as a northern textile town – many of the buildings date from 1850 to 1915 and are stone built of local “Millstone Grit”. At the turn of last century, many wealthy merchants and traders built fabulous wealth in Bradford, as can be seen from some of the local Victorian architecture. Population is now about 467,000, considerably less than its more prosperous neighbour Leeds (population 750,000). Unemployment was very high in the late 80s/early 90s but has come down considerably in the last 5 years. Crime is not low, though it is improving – with theft of vehicles and burglaries running at about three times the English average. Compared to Leeds, theft of vehicles is higher but burglary is lower, with overall crime similar (ref: Upmystreet.com). The city has an expanding University population – student numbers have increased considerably in the last 5 years and there are many more foreign students seeking accommodation, which makes for a robust rental market. The University is strong in science and engineering and its reputation as an established “red brick” University is improving. The city is only 9.5 miles from the prosperous northern city of Leeds – the financial capital of the north of England. I predict a strong “ripple effect” from people priced out of Leeds who choose to settle in central districts of Bradford (mainly BD1, BD5 and BD7). Residential property prices are at or below half of those in Leeds, and have languished for years in the doldrums, only recently starting to rise. Bradford is served by the Interchange Station - trains take 15 minutes to reach Leeds. Hence if you live in central Bradford, you could be at the office in central Leeds within 30 minutes. The rental market is strong with rents quite reasonable – because property is so cheap (say 60,000 pounds for a 4 bedroom house) yields are very attractive. To reduce void periods to a minimum, I would recommend purchasing property close to the city centre and University (within 10 minute walk). Bradford is only 6.5 miles for the expanding Leeds-Bradford airport to the north-east of the city – this airport has low cost flights to London, other UK cities and mainland Europe. Bradford is just off the M62, the main Manchester to Leeds motorway. Access south using the M1 is also easy. Traffic in the city is relatively light when compared with Leeds and other cities and the motorway leading south is the M606, which is reached in about 7 minutes from the city centre. 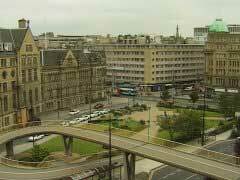 Bradford is just showing the first concrete signs of fast regeneration and positive change. In 1998, the “Little Germany” redevelopment quarter of the city centre (just north-east of the town hall area) with kicked off, though progress has not been fast until lately. Things have taken off with the start of demolition of buildings in front of the town hall, where plans are afoot to build a beautiful lake, with cafes and pedestrianised areas within the zone. This should help transform the city centre for the better. The Council seems competent and committed to re-generation and improvement. Bradford has many architecturally significant buildings from its days as a wealthy textile, and merchant / trading town. Most of these are still intact and bargains are to be had. If you aspire to own a large stone build Georgian or early Victorian terrace house in central location, Bradford could be a good long term bet for capital value increase. One thing that struck me was the amount of tourist attractions in the area – the council are doing a good job at promoting Bradford and I would envisage more tourism and interest in the cultural and historical background of Bradford in future. An example of this is the Bradford area being known as “Bronte Country”. Unemployment in Bradford has been a problem for many decade with the decline in textiles, manufacturing and heavy industries. That said, new service industries, retail and banking are reducing unemployment – many people also travel to other towns in the area for work and unemployment in West Yorkshire is generally decreasing – this should all support house prices as local demand remains strong and the high worker population can afford to become home owners. I like investing in areas where unemployment has historically been high but is coming down fast – this positive change increases house prices – I see this happening in Bradford. (See ripple effect house price charts). It seems Leeds was the first town/city for prices to pick up, some three years ago – the city’s prominence as a financial centre for northern England and large high quality University were two reasons, along with re-generation and new off-plan developments in Leeds L1 city district. Edgebaston prices tripled as this leafy Victorian area with high student population close to the city became trendy. After this, a ripple effect spread to the nicest neighbouring towns, particularly those with good access to the Yorkshire Dales to the north – Keighley and Skipton are two examples. 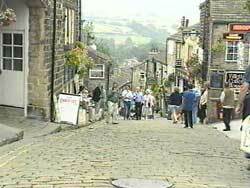 Then marginal but still pleasant towns such as Huddersfield “caught fire”. However, Bradford stayed depressed in part because of the Mannington riots a few years ago – these disturbances got international coverage and put a lot of people off Bradford, even though Mannington suburb is some 2 miles NW of the city centre. So even as the north started rising sharply in 2003, Bradford hardly moved until the end of 2003. In the last three months prices have started accelerating and are now running at 1.4% per month (April 2004) according to Hometrack.co.uk. My prediction is this will continue for the rest of 2004 at least and the time is right to buy for capital value increases. The agent I use is Mr Salim Khan (ANAEA) (Tel 01274 728000, Mobile 07958 673234) – his offices are between BD1 / BD5 / BD7 - close to the University, City Centre and Interchange rail station (all within 0.5 miles). He specialises in investment property and also has a letting and property management arm, and can introduce serious investors to some of the best opportunities in the area. Salim is experienced at advising and showing property investors a selection of favourable investment property and has operated in property in the area for some 15+ years. I favour the area in Bradford covering the north-eastern half of BD5, eastern half of BD7 and all of BD1 (except the northern quarter). This area has a diameter of some 0.7 miles and covers Lister Hills, Princeville, Shearbridge, eastern Lidgert Green, Bradford Foster Square, Little Germany, eastern parts of Little Horton, Dirk Hill and Little Horton Green. This area is convenient for the University, Interchange Station, City Centre theatres and entertainment, Kirkgate Centre and shops, the Town Hall re-development area and St Luke’s Hospital. Access south to the M606 and M62 is good. The area has many historic Victorian houses, and fits the strategy of buying in the most central parts of re-generating cities with good amenities and communications, where both young and old people will aspire to live as more jobs and wealth are created. When I left Bradford after a two-day visit in mid April 2004 I was most impressed with what was happening – very exciting. I share this information because I want others to find out what I am talking about – it really is an under-discovered area – but probably not for much longer. You can pick up a good cash-generating bargain and you don’t have to fight too hard for good stuff like you have to in places like Liverpool and Leeds. I’m pretty confident if you visit you will not be wasting your time.